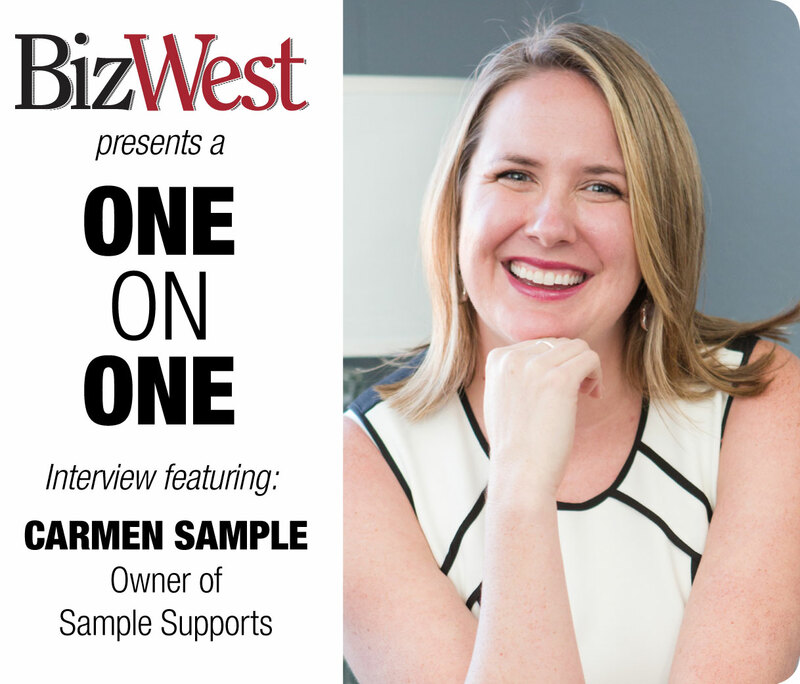 Each month, BizWest asks a business leader to participate in a question and answer feature to help shed light on a business topic, an industry or add insight to a field of endeavor. This month, Carmen Sample, owner of Sample Supports in Longmont, discusses the issues that affect the home-care industry that works with special needs adults. Sample believes the social services world can be profitable. Her business started with a host home program for adults, matching them with residential caretakers. Her organization since expanded to help small businesses integrate employees with disabilities with employees without disabilities, to provide a mutually beneficial relationship for both. While most of her competitors are nonprofits, Sample believes that social services can be improved for everyone when people start running what they offer like a competitive business. BizWest: How did you start Sample Supports? Carmen Sample: When we started Sample Supports, we targeted adults in institutions. We started in 2009, during the recession, when there was a freeze on resources and a 30-year waitlist to get help. Colorado has historically had low funding. It’s one of the most progressive in service delivery because we’ve had to be creative in our services. We have about 250 competitors, agencies doing similar things we did, and the only people who came to us were ones who were kicked out of other agencies. Our first 10 clients were all kicked out of other programs. But by doing that, we developed a strong philosophy right away. BW: What was that philosophy? Sample: We took care of a young woman who was kicked out of her day program all the time. She tried to have an out-of-home job and we’d get a call that she’s banging her head on a wall and they wouldn’t figure it out. There’s an acceptance in the industry to be like, “They’re too hard; we’re not going to work with them.” We started our residential program and at one point we had these individuals in residential homes who had been kicked out and now are sitting all day at home with a provider. So we got day program approval and employment program approval. We had a super fast growth rate, the providers were impressed that we could handle the hard and never sent anyone home for behavior. BW: Tell me about your employment program. Sample: We had been doing day program services and saw that when our clients were not involved in meaningful activities, we saw more behaviors because they were bored. Our employment program was a way to get them involved in activities outside the house. My husband was working at Left Hand Brewing, and he needed guys to do the packaging. So we contracted with Left Hand and sent a few guys who wanted the job to make mixed packs and be paid competitive wages. Soon, we had a waitlist of people calling us. Of the 250 agencies out there, only a handful were doing employment. We started a lawn care program — we had a guy with autism who was obsessed with lawn mowers. We started a cleaning company because a client with OCD loved cleaning. We tried to find other businesses to employ our people, but it could be difficult. They take an amount of work and time and energy. Sometimes their behavior can escalate at work and then they’re not working. We started our other businesses to be entrepreneurial, but there was an additional win in that we could also employ these people. We started Crystal Joys, a gemstone and independent jewelry store. Then we decided to build a restaurant. We currently employ more than 500 people and half of them have disabilities. BW: Why combine your social work with launching so many small businesses? Sample: My parents were entrepreneurs, and I’ve always been entrepreneurial. A lot of people who are social workers are not great business people. But I’m a social worker, and I like business. A lot of social workers go into nonprofits. My edge was that I knew I could do this: I wasn’t afraid to start a restaurant or jewelry store. BW: You’re in social work, but what you do is not a nonprofit. Sample: I had worked for several nonprofits that were lucrative, and the waste that happened there was startling to me. Hundreds of thousands of dollars were written off because people were not doing their jobs. Nonprofits are profitable; they just often invest it in things they don’t need or run their agencies ineffectively. They waste dollars that could go back to clients or employees. In 2009, we were one of the few for-profits. We bill the state the exact same amount as our competitors, but we offer better services and better quality of life because we’re competing. Profit gets used like it’s a dirty word, but we ran on a 15 percent profit margin. We don’t get the same kickbacks, and we’re probably making less profit than a nonprofit. BW: People often have a visceral reaction to thinking about for-profit companies offering social services. How do you get around that? Sample: We’re transparent. The work we do is a community need. Just like a construction company that contracts with the government, you don’t expect them to be a nonprofit. You have to pay people to provide these services. We’re providing a community need and from our viewpoint competition raises the bar of service delivery. And we have proof that works: Of 500 agencies, we’re ranked No. 5 and the other top 10 are mostly nonprofits. We have to provide great services and make sure people stay with us. The only way we survive is if we have the best services. More and more groups are moving to a for-profit model. There’s probably some public perception issues with being for-profit, but we never ask for donations and bill the same as a nonprofit. We hold ourselves and everyone to a high standard. BW: What do you want to see in your industry in the future? And what can we expect from you in the future? Sample: I want to see more competition. Bring it on. My goal is to take our model national. To us, it’s fun to grow. We’re looking to expand to Portland, Maine, next. I’m excited to go, set up shop and raise the bar. We’ll make everyone else in Portland be better. And if someone new wants to start in Longmont, let them.